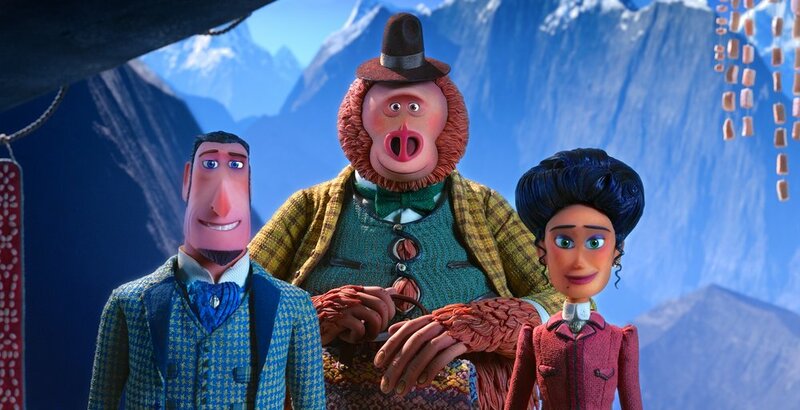 Laika Entertainment has consistently released excellent works of stop-motion animation since its 2009 feature film debut, Coraline, but its fifth and latest release, Missing Link, doesn’t live up to the studio’s other works. Directed by Chris Butler, Missing Link is the kind of movie that would be fine without a bar set so high for quality storytelling, but with four better movies preceding it, Missing Link’s release shortchanges any viewer who has excitedly waited three years since Laika’s last film for its next great work. Set during the industrialist era, Missing Link finds intrepid explorer Sir Lionel Frost, voiced by Hugh Jackman, on a quest to find a sasquatch, the evolutionary figure between ape and man. Always on the lookout for mythical creatures, Sir Lionel hopes that his discovery will be the great achievement he needs to join a stodgy, prestigious club of British explorers. Right from the choice of main character, Missing Link seems at odds with Laika’s body of work. In previous films Coraline, Paranorman, The Boxtrolls and Kubo and the Two Strings, the characters are all disadvantaged or downtrodden in some way. Missing Link’s protagonist is a wealthy man, whose only disadvantage is that the technophobic leader of a society of explorers doesn’t like him. Sir Lionel is confident and uncaring toward others. When he finds the sasquatch — capable of speaking English and voiced by Zach Galifianakis — and when he accidentally recruits a widow named Adelina Fortnight into their exploring group, his only motivation is to look out for himself. Laika should by no means be held to an expectation of making all of its films similar to each other, but when its previous stories all championed the downtrodden, the newest release raises the question of why it is worth devoting months of careful detail to a story about an overconfident white man upset about not being accepted into a club he wants to be accepted into. The artistry of Laika’s films is, as always, top notch. The credits include a scene showing time-lapse footage of the stop-motion animation at work, and Missing Link holds up to the artistic bar set by previous films. Movement is fluid, and the designs take advantage of mixing realism with exaggerated characteristics here and there. The animation is immersive and doesn’t take viewers out of the narrative of the film. Unfortunately, when it comes to staying within this narrative, the viewer’s journey is not always full of fun. Missing Link is full of jokes that either don’t hit the mark or fall flat. For example, Galifianakis’ sasquatch, who chooses the name Susan, complains aloud that he’s “literal.” The repeated joke situation is of Sir Lionel using an idiom, only for Susan to misinterpret it, ending up with him cracking open a window by punching through the glass or throwing a grappling hook — rope and all — over a wall. Sometimes, it’s funny, but at other times, it’s a tired repeat of Amelia Bedelia or Guardians of the Galaxy’s Drax. As a globe-trotting adventure, the film feels unfulfilling from time to time, as the heroes can easily travel from place to place. Struggle is a fundamental part of exciting adventures, but it’s pretty easy for Sir Lionel to travel across the United States or find mythical beasts. The central struggle of the film feels pointless from the beginning; Sir Lionel could just as easily decide that he doesn’t want to be part of the club that turns him down. While centering around an overconfident man, Missing Link underserves its female supporting role. Adelina, voiced by Zoe Saldana, comes along for the ride of the adventure, but her character is barely present and underdeveloped. At the conclusion of the film, she teases toward future adventures on her own, which, at the end, seem more appealing than the rest of the film. With only one new Laika film every two or three years, Missing Link is an unfortunate disappointment. It lacks the depth of its predecessors and doesn’t tell a story that feels necessary or tremendously creative. When the credits roll, viewers can at least take comfort in Walter Martin’s “Do-Dilly-Do (A Friend Like You),” a jaunty song that’s more enjoyable than the film it’s featured in.